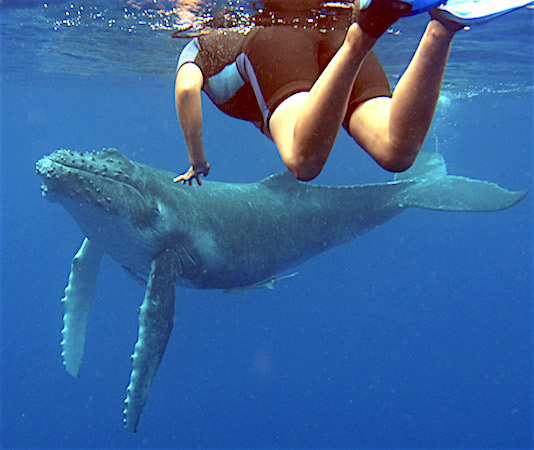 Swim with Humpback Whales in beautiful Vava’u, Tonga 7 & 9-night tours – Book now! Join us to swim with Whales in Vava’u, Tonga in 2019! We offer personally-escorted, all inclusive, small group ‘snorkelling with whales’ eco-tours tours, with longer days and more time in the water for you – there are NO hidden costs. 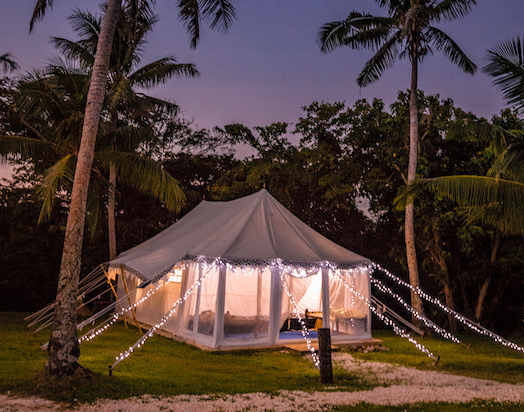 Our tours include 7 or 9 nights at beautiful, beach-side, luxury Glam-Tents (with timber floors & full ensuite bathrooms) or boutique-style accommodation, with friendly and welcoming hosts, delicious food, snorkelling on reefs and in caves, and definitely lots of fun! We also include airport transfers in Vava’u. We have been operating our swim with whales tours in Vava’u, Tonga for 19 seasons and our dedicated and passionate crew know how to take care of every detail of your time with us, therefore offering a humpback whale experience you will never, ever forget! Join us in Vava’u! We want to share this amazing WhaleSwim Adventure with you! PLEASE NOTE: We DO NOT operate day-trips! We are close to being fully booked in Tonga for the 2019 season – with only a few spaces available now! If you can’t find the dates that you would like, did you know that you can also join us to swim with the whales in beautiful Moorea, Tahiti ? OR in our newest amazing location in Tofo, Mozambique. Check our home page for more information. 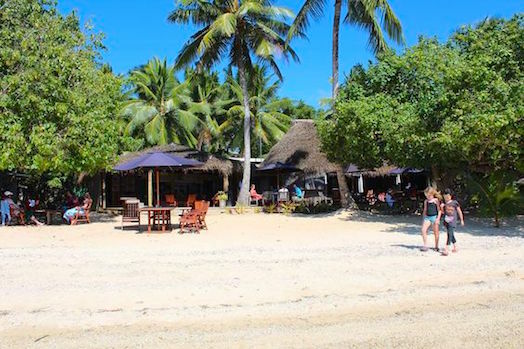 Breakfast and 5 evening meals | great food and beachside bar | 2 free evenings to experience Traditional Tongan food night or a restaurant in town |delicious lunches on the boat each day. Snorkelling reef just of the beach, kayaks available! Lots of fun! Day 1: Breakfast | board whaleswim boat at the resort jetty | boat briefing | how to swim with whales training (how to have great encounters!) | out with the whales & lunch | lots of fun | return to jetty around 4.30pm | transfer to hotel | dinner. Day 2 – 7: Breakfast | board whaleswim boat at the resort jetty | out with the whales & lunch | lots of fun | return to resort jetty around 4.30pm | dinner or free evening to go into town for dinner. (Farewell dinner last night). Sunday’s are a compulsory holiday in Tonga. A day to go kayaking, snorkelling, enjoy the beautiful beach or just relax and read a book. Day 8: Breakfast | End of tour | transfer to the airport. 7 nights accommodation with ensuite bathrooms. All meals except 2 evening meals – free nights to experience some local restaurants or a traditional Tongan feast | great food and cocktails available. 5 full days on the water with the whales guided by our certified/experienced/passionate Guides | education/research data collection. Opportunities to snorkel in coral reefs | in underwater caves | beachcomb on uninhabited islands. 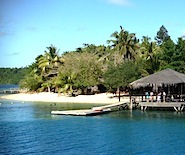 Airport & boat transfers in Vava’u. Day 1: Breakfast | transfer to jetty board whaleswim boat |boat briefing | ‘how to swim with whales’ training (how to have great encounters!) | out with the whales & lunch | lots of fun | return to jetty around 4.30pm | transfer to hotel | dinner. Day 5: Sunday’s are a compulsory holiday in Tonga. A day to go kayaking, snorkelling, enjoy a beautiful beach or just relax and read a book. Day 6: Breakfast | transfer to jetty – board whaleswim boat |out with the whales & lunch |arrive island resort around 4.30 | Farewell dinner. Email us for more information about these fabulous tours! Full breakfast each day | delicious lunches aboard the boat | 7 evening meals – great food! | 2 free evenings to experience Traditional Tongan food night or a choice of cafes & restaurants. 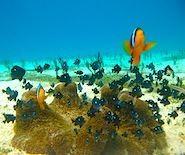 Snorkelling reef offshore at resort | kayaks available. Lots of fun! Arrival Day: We meet you at Vava’u airport | transfer to Vava’u Villa |free day| 6.30pm Welcome Dinner. Day 1: Breakfast | transfer to whaleswim boat at jetty | boat briefing | ‘how to swim with whales’ training (how to have great encounters!) | out with the whales & lunch | lots of fun | return jetty around 4.30pm | dinner or free evening. Day 2 – 3: Breakfast | transfer to whaleswim boat | out with the whales & lunch | return to jetty around 4.30pm | dinner or free evening. Annah is based in beautiful Russell, Bay of Island, New Zealand when she is not in Tonga, Sri Lanka or Norway! Annah has been valuable part of our team, most seasons since 2002, and is one of the most experienced whale guides in the world. Her passion and love for the ocean and all marine-life and in particular whales, is definitely catchy! 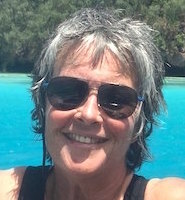 She will be your Tour Leader for the 2019 season in Vava’u Tonga! About our Tours – to find the information for each title below – click the title (with light blue background) and the information will drop down! Our aim is to take you to the best whale-swimming experience possible and to give you so much more than just a fleeting glimpse of the whales and quick encounters. We love the whales and are passionate about what we do. We know that the best encounters are respectful ones. We know that day trips operators cannot take the time to show you the best way to be with the whales and they often have not got the time to work gently with them. We know that immersing yourself in many different whale encounters over a minimum of 5 days is the very best way to experience the very intimate and profound privilege of swimming with these magnificent beings. We like to take care of the detail! We make sure that your tour flows smoothly so that you can relax and enjoy your whale-watching and island time. AND . . we know that once you have swum with them, once you have looked into the eye of a whale, you will want to do it again and again. Tour prices do not include: airfares to Vava’u, some evening meals, activities on leisure day, travel insurance, snorkelling equipment and wetsuit/vest, alcoholic and non-alcoholic beverages, transfers to other accommodation or Tongatapu transfers. Online ‘Book your Tour’ reservations will be held for 14 days. The non-refundable deposit of AUD$2,000.00 (9-night tours) & AUD$1,500.00 (7-night tours) is required within 14 days to confirm a reservation. Payment (Australian Dollars only) in full is required 70 days prior to your WhaleSwim Adventure and is non-refundable. Re-scheduling and substitution of guests is permitted with approval of WhaleSwim Adventures. A Liability Waiver must be signed by each guest & returned to our office within 14 days of booking your WhaleSwim Adventure tour. Travel insurance is mandatory for all our WhaleSwim Adventures guests and should be taken out at the time of booking. Your travel insurance must provide cover against personal accident, death, medical expenses and emergency repatriation with a recommended minimum coverage of US$200,000 for each of the categories of cover. It must also cover trip and flight cancellation. We also strongly recommend it also covers curtailment, personal liability and loss of luggage and personal effects. You must provide WhaleSwim Adventures with proof of your travel insurance within 14 days of booking your tour; you will not be able to join the tour without it. All rates and conditions are subject to change. If payments are not received at the designated times, WhaleSwim Adventures, reserves the right to sell those spaces in question with forfeiture of all monies to date. The booking is binding and all payments are non-refundable. These are ecological holidays, WhaleSwim Adventures reserves the right to ask any participants to leave the group should he/she behave in a way that is insensitive to the whales, the environment, local people, our staff, crew or other group members or continually not follow the WhaleSwim Guides directions in the water with the whales. WhaleSwim Adventures staff and management also reserve the right to move those guests to other accommodation at the guests expense. No refund will be given. If the WhaleSwim Tour Leader and/or the licensed whale-watching guide is not satisfied with your fitness, agility and snorkelling ability, they have the right to refuse you entry to the water with the whales as your lack of ability may endanger yours and the lives of others. Smoking is NOT permitted on our whale-swim vessels. Should bad weather prevent our whale watching vessel to go out on a ‘whale watching’ day, no refunds or extra day whale watching will be offered by WhaleSwim Adventures. Children/teenagers under 18 years old are not accepted on our tours. If the minimum bookings of 4 people on our 6-person tours and 6 people on our 8-person tours is not reached 8 weeks prior to departure of each expedition, then WhaleSwim has the right to cancel the expedition and refund any monies paid to them or transfer guests to another expedition. Any airfares booked and paid for by the guest should be covered by their travel insurance. 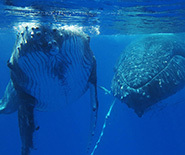 We swim with the whales in The Vava’u Islands, the northern island group in The Kingdom of Tonga. To join your WhaleSwim Adventure, you need to fly Internationally to the main island of Tonga – Tongatapu (the capital is Nuku’alofa and the airport code TBU) OR fly via Nadi Fiji directly to Vava’u (twice weekly flights). There are only 3 international airlines servicing the main island of Tonga – Air New Zealand, Virgin Australia and Fiji Airways. If flying into Tongatapu you will also need to book a 1 hour domestic flight to Vava’u. You can also book flights with Fiji Airways, directly from Nadi, Fiji to the international airport in Vava’u, where we swim with the whales. See twice weekly flight details further below. See below for an overview on getting to Tonga. When booking airfares please note: There are no international or domestic flights in Tonga on Sundays. ADULT FULL FLEXI FARE: TOP$660 (approx. 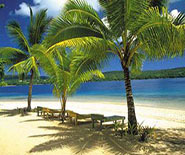 USD$285 or AUD$375.00) return to Vava’u. The international flight schedules into Tongatapu (Nuku’alofa) the main island of Tonga often have you staying “overnight” (for a few hours between 1.20am and 6am) in Tongatapu. You can then a morning flight with Real Tonga to Vava’u. The Dateline is in the main town of Tongatapu. It is one of the nicest hotels on the main island and they can arrange airport transfers for you. It is around a 30 minute drive from the airport and should cost you around TOP$50 (USD$22 / AUD$33) each way if you get a local taxi. There are other smaller locally owned guest-houses nearer the airport. Please note that staying at the airport is not permitted and would not be very comfortable if it was. Only 3 international airlines fly into Tonga. OUR PICK! Fiji Airways –www.fijiairways.com Book directly from Nadi, Fiji to the international airport in Vava’u, where we swim with the whales, or Nadi to Tongatapu. Virgin Australia www.virginaustralia.com Direct Flights from Sydney Australia to Tongatapu – the main island of Tonga. Air New Zealand –www.airnewzealand.com.au Flies from all major cities in Australia via Auckland to Tonga – more flights on Air New Zealand and you may find easier and more suitable flight departures/arrivals. You could consider returning on Air New Zealand or via Fiji with www.fijiairways.com direct from Vava’u via Nadi to Australia on Saturdays and Wednesdays. Important to note: you have to depart LAX 2 days before you want to arrive in Tonga as you will be crossing the International Dateline and will lose a day. You will gain a day on the way back though! There are 3 international airlines servicing Tonga from LAX International Airport. OUR PICK! Fiji Airways daily from LAX via Nadi, Fiji direct to Vava’u on Wednesdays and Saturdays): www.fijiairways.com You need to book from LAX on Monday or Thursday to get to Vava’u on Wednesday or Saturday – remember you fly over the International dateline – so you miss a day, but gain it on the way back! Crazy I know! There are many choices of airlines to either Los Angeles or Auckland, New Zealand. From Los Angeles with Fiji Airways via Nadi Fiji then direct to Vava’u or from Auckland to Tongatapu (the main island of Tonga) with Air New Zealand then a domestic flight to Vava’u – where we swim with the whales. The quickest flights are with Air New Zealand from Heathrow via Hong Kong and Auckland to Tongatapu – the main island of Tonga THEN a domestic flight to Vava’u. Go to www.airnewzealand.co.uk – enter Heathrow to Tonga – all flights connect with the Auckland to Tonga schedule – see above in ‘From Auckland New Zealand to Tonga’. Your flights have to be via Fiji, Sydney Australia or Auckland New Zealand. You may like to add an extra day or two to your Tongan holiday and stay on in Tongatapu. If you are travelling to Tongatapu from Australia or on the late afternoon/evening flights from Auckland you will need to book accommodation overnight. We are happy to help with recommendations, as its sometimes daunting to know what accommodation to choose. The Tanoa International Dateline is now the only large hotel style accommodation available in Tongatapu. Tanoa International Dateline Hotel offers a selection of superior accommodation. Located on the waterfront in the capital, Nuku’alofa, Tanoa International Dateline Hotel can be used as your hub to get around Tonga. With a range of dining options, and high-speed internet in every room, this is the place to be. Ideal if you are saying on the main island for several days – it is 35 minutes drive from the airport. Airport Transfers: You can add transfers to your booking. You may like to add an extra day or two to your holiday in Vava’u. We are happy to help with recommendations, as its sometimes daunting to know what accommodation to choose, so we have put together a list of accommodation for you. You will need to book these properties directly. Click here for the list with contact information. We have either stayed at or personally inspected these properties, or had them highly recommend to us by our guests. We can book the accommodation listed below for you though. You can add extra nights at these 3 hotels with your online WhaleSwim tour booking – subject to availability. 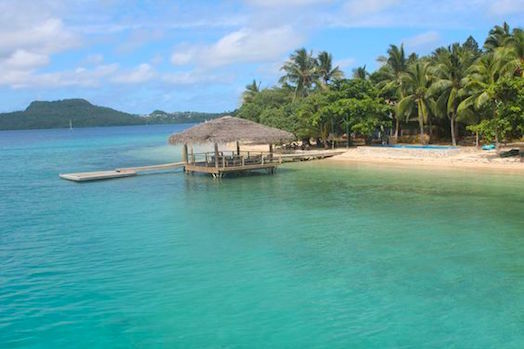 Vava’u Villa is situated on the most breathtaking island group in the South Pacific. It offers a tranquil, comfortable and relaxing stay with panoramic views of the water. Relax in the cool ocean breeze or swim at Muikilekila Beach, a 2 minute stroll away from your room. 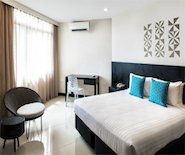 The Vava’u Villa Hotel offers – ensuite rooms in the boutique-style Villa All accommodation is very tastefully furnished and decorated, with a spacious and open living area, verandah’s with water-views from the Villa and wifi available. 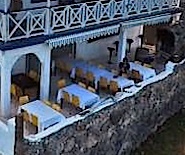 Enjoy the friendly restaurant with fresh tasty food and the popular verandah bar. * Beach Cruiser Bikes are available free to our guests, bookings required. * The Villa is a booking agent and will book local tours and activities for you. Vava’u Villa is located less than 3 km from the main town of Neiafu – where there are a variety of cafes and restaurants – just a TOP$8 taxi ride away. Book this accommodation online with your tour ! We will provide you with a comprehensive Trip Preparation guide when you book. This will give you all the packing and supplies information you will need (with good advice re your snorkelling gear) but as a general rule, remember that Tonga is a laid back, tropical place and light, casual clothing is the most suitable. The most important items on your packing list will be your snorkelling equipment – your snorkel, mask and fins. We do not provide snorkelling gear. Hire gear is never going to fit you as well as your own equipment and, having come all this way to swim with the whales, we want you to have the best experience that you can. You are going to be snorkelling every day for 5 – 7 days and good quality, well fitting gear is going to make your WhaleSwim Adventure so much better. Please note that wearing of buoyancy gear (wetsuits or snorkel vests) is compulsory when we are swimming with whales. 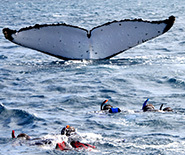 You may want to bring a light wetsuit for warmth and buoyancy while swimming with whales. Water temperatures are between 23 degrees C (in the earlier part of the season) and 26 degrees C, so for most people a 3mm shortie wetsuit is fine but if you really feel the cold you may want to bring a full 3mm wetsuit. If travelling light you can purchase or hire one of our excellent WhaleSwim neoprene snorkelling vests. These can be ordered when booking your tour. Towels will be supplied by your resorts. This is an ocean adventure holiday and you will need to be reasonably fit, confident in the water and be able to snorkel well. We are often getting in and out of the boat into the ocean, sometimes snorkelling quickly for up to 50-80m and we may occasionally be in choppy seas. Although humpback whales are 12 -15 metres long and weigh about 40 ton, they are gentle animals and are very aware of us in the water. They will even drop their 5m long pectoral fin or turn their tail fluke to avoid us as they swim by. The calves are sometimes very curious and they often seem to love to be around us. 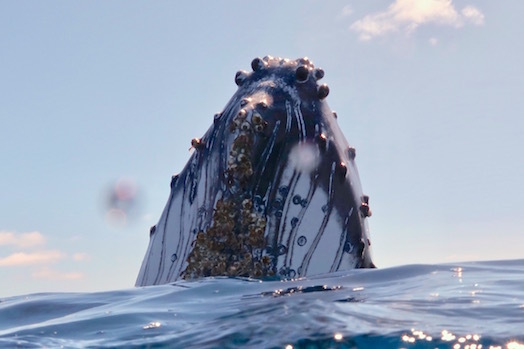 The thought of being so close to them may be frightening ­but after your first encounter you will understand why they are known as the gentle giants of the sea. It is very important for you to know that some of the in-the-water encounters with the whales may be in very deep water and well away from land. 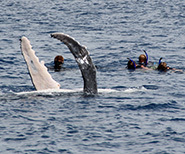 Your level of skill and confidence will determine whether our Guide will allow you in the water with the whales. If you feel that your swimming and snorkelling skills could be improved, or that you are a little unfit, we suggest that you enrol in snorkelling lessons and improve your swimming skills and fitness levels prior to joining your tour to insure the best encounters possible. Our tours cater for a maximum of 8 guests only. Tongan Whale-watching Regulations allow no more than 4 people plus a guide in the water with the whales at any one time. With only 8 guests onboard our whaleswim boat this means that you are in the water with the whales every 2nd time. You will have the opportunity for many in-the-water encounters during our 5-7 days of whale-watching, plus you will have time to enjoy the incredible up-close surface action. We know that the best whaleswims are respectful ones. If we take care around them and understand the incredible privilege that it is to be with them in their world we are often able to experience extended encounters. The whales decide and when they trust us they stay often stay longer. We offer package tours with a minimum of 5 days on the water because we know that being out for multiple days with the same group of people allows you to learn how to best be with the whales and it allows us to maximise your chances of amazing encounters. We also make sure that we only use the best boats and have the best skippers. A good whale-watching skipper knows that the best way to get great encounters is to take the time to let the whales get used to the boat and for the swimmers to be an un-intrusive as possible. 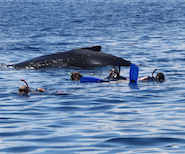 We can create the best whaleswim opportunities because we have the time to teach our guests the best way to be with the whales and we have multiple days to swim with them. It is harder for the day trip boats because they have such limited time and are under pressure to deliver the swims. Their swims can be fleeting. If you are coming all the way to Vava’u you need to give yourself as many days as you can to experience being with the whales. Just a little warning though… swimming with them is really addictive. Whale season in Vava’u is mid-July through to mid-October. Some days are sunny; some days are cloudy, some days are rainy and windy. The weather is warm, but you’ll want to bring a wind jacket to keep you comfortable on the boat. Water temperature is around 24C (75 F) to 26C (79F) later in the season. Vava’u is the best place in Tonga for the most in-water encounters with humpback whales as the majority off the Tongan humpback population, mate and give birth on this latitude. Only snorkelling is allowed with the whales as they don’t like divers’ bubbles, and it’s hard to keep up with whales on SCUBA. The topography of the islands allows us to work in most conditions, excluding intense weather days of course. We will go out and swim with the whales in most conditions, the weather and seas don’t seem to affect the whales at all. We search for the whales in calm, sheltered bays, open sea — pretty much wherever the day and the whales take us! Weather, temperatures and whale behaviours will effect our day to day on-the-water plans but we aim to explore the various caves, coral gardens and abundant marine life that inhabit the waters around the Vava’u Islands as a part of our tour. We head back to your accommodation in time for a hot shower and to relax and watch the sun set before dinner. 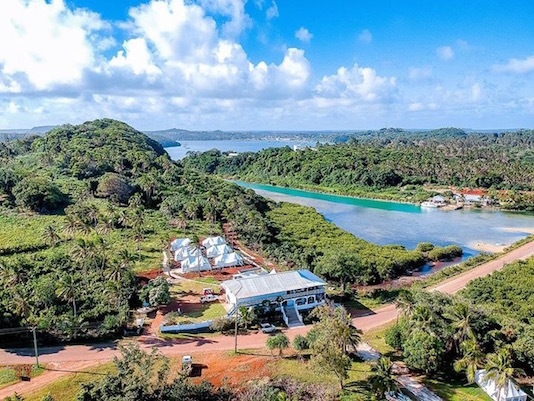 Tongan Beach Resort spans 180 meters of beachfront with all 12 guest rooms enjoying views of the golden sand beach and crystal clear turquoise waters of the Port of Refuge Harbour and on some days the humpbacks are seen frolicking in the beautiful clear waters in from of the resort. Our boat picks you up at the jetty each morning and heads out to the whale mursery. 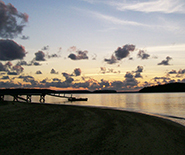 The resort is nestled on the beachfront of the island of ‘Utungake. There is safe swimming at all tides. There is a fully licensed restaurant with great food, in addition to our Sandpit Bar (that serves excellent cocktails as well as an extensive variety of wine and spirits. There is a large library, a beach towel service, and a water taxi service to Neiafu and back. Just a 15 min drive to the main town and several great restaurants and cafes overlooking the beautiful harbour to experience a fresh lobster, delicious Italian or Asian food, watch an international rugby during your meal and other interesting night-life events in Vava’u. 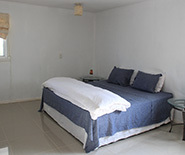 All rooms have top quality beds and 100% cotton bedding and towels and are only meters away from the water’s edge. 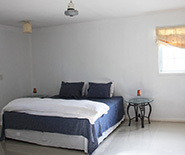 The rooms are fitted with electric ceiling fans with open entrances allowing for a natural sea breeze if desired. 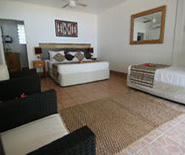 Each room has its own covered decked balcony with table and chairs to relax and watch the sun set. Their experienced staff are very friendly and will make your time at the resort an easy and fun experience. Your hosts Ian and Vanessa Jones are fun people and have created an amazing adjoining business with sustainability in mind with their coconut & vanilla production. Along with their team, they will make you very welcome and make sure your stay with them is as memorable as your encounters with the whales! The rooms in the villa are light and airy with a distinctively Tongan motif and comfortable beds provide you with a quiet and relaxing refuge. The sheets are made from 100% high quality linen fabric and you have a choice of pillows for extreme comfort. Personal Wifi is available in your room. The beautiful Glamping Tents have full en-suite bathrooms and will have timber floors before July 2017. It is a unique glam-camping experience – with all the comforts of a standard hotel room, but in a tent. Temperatures July – October are typically 19C – 22C at night and 24C – 26C during the day. Vava’u Villa and Glam-Tent Hotel sits amidst a tropical paradise with cool ocean breezes and a cozy home away from home atmosphere. It is the very best place to rest your mind and soul. Vanessa is a foodie and her food is fresh and delicious (much of it from her on-site organic vegetable garden!) and full of local and international flavours. You will enjoy the friendly bar too. They make excellent cocktails and have a good range of local and international beer as well as spirits and liqueurs. They have an outdoor fire in the bar, perfect place to enjoy a drink and a chat on the cooler evenings. You will get to meet some of the locals here too. while filming for the incredible BBC ‘Blue Planet’ series. New Zealand Yacht Charters Ltd in association with WhaleSwim Adventures Ltd.